Elementary Sunday School Lesson: What Is Prayer? 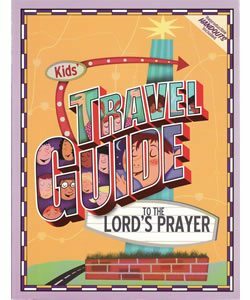 Use this Sunday school lesson with kids of all ages from the popular book Kids’ Travel Guide to the Lord’s Prayer. Find more great Sunday school lessons to help kids grow in their faith. God desires to have a relationship with each of us, and an important part of any relationship is communication. God has established prayer as a means for us to communicate with him. Through prayer, we can praise God, ask for forgiveness, thank God for all he’s done, and let our requests be made known to him. Prayer allows us to open our hearts to God and let him know our innermost thoughts and desires. Children are eager to communicate with anyone who will listen to them, but they often feel adults don’t care about their thoughts, concerns, and opinions. Use this lesson to teach your children that God wants us to talk to him and gives us many examples of prayer in the Bible. Celebrate with them the joy of communicating with God. How can we teach children about prayer without actually taking time to pray? If you don’t have enough time to pray, you don’t have enough time to teach! Fight the temptation to dive into the lesson without asking God for his wisdom. Spending a few minutes in prayer can make the difference between wasting your time and watching it produce much fruit. God will give you the wisdom to teach as you ask him for it (James 1:5). Before you pray remind the children that they can talk to God as they would their best friends. God wants to hear what each person has to say. Invite each child to thank God for one good thing that happened in the past week. Then pray: Dear Lord, thank you for loving us and hearing us when we pray. Help us to learn to talk to you every day, in every situation. Thank you for answering our prayers and helping us to please you. We love you and praise you for all you’ve done. Amen. This activity emphasizes God’s love for each child and his desire to communicate with us. Borrow a book of sample invitations from a stationery shop. Let children look at all the fancy and expensive invitations for inspiration as they make their own. When have you been invited to something fun, like a birthday party, wedding, or another special event? How did you know you were invited? What do invitations look like? What do they say? Say: God has invited each of us to spend time with him and talk to him. God wants us to talk to him! When we talk to God, it’s called prayer. Let’s make invitations from God, inviting us to talk to him. Remind kids that this is God’s personal invitation for a special visit, so they should work to make the invitation as nice as possible. Then when the invitations are finished, have children deliver them to each other. When you have something important or exciting that you want to share with a friend, how do you usually communicate with him or her? Do you need to send a special invitation to talk with your friend? How would you feel if every time you had something to talk about with your friend you had to make an appointment or send an invitation? Say: We don’t need an invitation to talk to God. God wants us to talk to him. When we talk to God, it’s called prayer, and today we’re going to be learning more about what prayer is. Children will consider reasons people prayed in the Bible, and reasons why we pray today. If you have adult or teen helpers in your class, ask them to join different groups and help the groups locate and read their assigned verses. You may want to write these verses on slips of paper ahead of time to make it easier for children to refer to them. Boldly print the letters of the alphabet down the left margin of the newsprint or whiteboard, and place it where children can easily see it. Open your Bible to Luke 11 and read verse 1 aloud. Why did the disciples need to be taught how to pray? Do we need to be taught how to pray? Why or why not? What do you think prayer is? Say: The Bible gives us hundreds of examples of prayers. One prayer from the Bible that many people know is called the Lord’s Prayer. We’re going to spend the next weeks learning about this prayer. But first, let’s look in the Bible to find a few other prayers. We can see why people prayed and what they said in their prayers. This will help us understand more about what prayer is. Have children form five groups. Be sure that each group has a Bible. Assign each group one of the following Scriptures, and have the children read the verses together and determine why the person was praying. Allow several minutes for children to read and discuss. Then ask each group to report why the person in their passage was praying. As they report, write their answer beside the letter of the alphabet that corresponds with the first letter of their answer. For example, Group 1 might answer “guidance,” so you would write this beside the letter G on your alphabet list. Group 2 might say “wisdom,” so this would go beside the letter W. Groups may have more than one answer, they may use a short phrase for their answer, and there may be several answers for some letters of the alphabet. After each group has reported, say: Let’s fill in all the blank letters now. Think of other reasons you or other people you know pray that begin with the letters we still have available. Have the class work together to complete the alphabet. Your list might include Ask God for something, Blessing, Confession, Direction, and so on. Here’s help on the difficult letters. Q: Quiet heart or Quest for help. X: eXcitement for what God has done or eXpress praise. Y: Yearning to know God or saying Yes to God. Z: Zeal for God or Zillions of things to thank God for. Bring along a dictionary or thesaurus for extra ideas. The say: Wow! This is a wonderful list. It shows us there are so many reasons to pray to God. Our list also helps us see that prayer is more than just saying thanks to God before we eat, or more than asking God for a new bike. It’s a special way of communicating everything about our lives with God. And best of all, God wants us to talk to him! Let’s read about one more reason we can pray. Read Philippians 4:6 aloud, and ask what this verse teaches us about prayer. Then say: God doesn’t want us to worry about things. God wants us to tell him what’s going on in our lives and let him take care of it. Let’s say this verse aloud together. Say the verse aloud several times, letting children repeat each phrase. Then say: The Bible makes it clear that God wants us to talk to him. It’s great to know that God cares about us enough to listen to us all the time! Children will consider ways we communicate with people and ways we can communicate with God. Sign language group: Only use hands and gestures to communicate. No sounds or lip movement allowed. E-mail group: Sit back-to-back and write messages on paper, then hand them to others in the group without making eye contact or speaking aloud. Letters group: Write messages on paper, and silently deliver to others in the group. Telephone group: Sit back-to-back and talk without making eye contact. Talking face to face group: Converse normally. After children have communicated jokes for several minutes in this manner, have them sit in their groups and communicate normally as they continue this activity. The say: Think of at least two reasons your group’s kind of communication is good and at least two reasons this kind of communication is not good. For example, you can use sign language in places where you’re supposed to be quiet, like a library, but you can’t use sign language to talk on the phone. Allow a few minutes for discussion, then have each group report its answers. If you had to choose only one of these ways of communicating, which one would it be and why? Which of these ways can we use to communicate with God? Which form of communication is easiest for you to use to talk with your friends? your parents? God? Which of these ways of communicating will you use to share what’s on your mind with God this week? Then say: God doesn’t care how we communicate with him. We can write, speak, or even think what we want to communicate to God, and God hears us and understands us. And God never gives us a busy signal or says the words in our letters aren’t spelled right or tells us to come back later when he’s not busy. God hears our prayers any time, any place, and any day. God wants us to talk to him so he’s made it easy for us to pray! Children will use a rhyme with hand motions to remind them that they can always talk to God. Say: In Isaiah 30:19b, the Bible says, “How gracious he will be when you cry for help! As soon as he hears, he will answer you.” God wants us to talk to him. He’s ready to hear our every word. Let’s learn a poem to remind us that we can pray any time and God will hear us. Lead the kids in the following rhyme, doing the hand motions and letting children repeat the words and motions. Children will record prayers and keep track of God’s answers over time. Say: We’re going to be learning about prayer for several weeks. Let’s start keeping track of what we’re praying about, and see what God does in our lives and in the lives of others through these prayers. Give each child a “Prayer Journal” handout, and make pens or pencils available. Then ask children to write or draw at least two things they want to pray about this week and include the date. Have older children help younger ones who cannot write. Explain that each week kids can add to this list, and they can also note how God answers their prayers over the coming weeks. Cut poster board or heavy paper into 4×4 squares. You will need two squares per child. Give each child two squares. Have the children write or draw a picture of something they would like to talk to God about. It can be something they’re thankful for, something they’re concerned about, or a visual expression of praise. As children complete their artwork, invite them to take turns taping their squares to the wall, starting down low near the floor, placing one on top of the other to create a tower of prayer. As you watch the tower grow, notice all the different things the children want to pray about to God. Explain to kids that this is a visual reminder of all the reasons we have to pray. Say: Our tower is tall, but it’s not how high it is that matters. Our prayers reach God no matter how big or small they are. Dear God, thank you so much for loving us and for listening to our prayers. We’re glad that you want us to talk to you. Help us to talk to you every day this week, no matter what’s going on in our lives. Amen. Have kids write their names on the back of their Prayer Journal pages, writing the letters down the left margin. Then have them refer to the ABC list created earlier and write reasons to pray that match the letters of their names. This adds a personal dimension to praying! Want more lessons like this? Check out all our Travel Guide books today! Awesome words of God teaching. Thank you for this lesson. The kids have loved it.. and I have been using What I Prayer all month. The kids have really grown about why we pray. Thank you so much for sharing, Candace! We love hearing stories of the way God is moving in children’s lives. This will help the kids in our church. You’re welcome, Mark Anthony! We pray our lesson is a blessing to your ministry! This was a superb lesson for my children. They especially enjoyed composing invitations to pray. I’ve thoroughly enjoyed sharing this with the children. That’s wonderful to hear, Vera! Thank you for sharing!